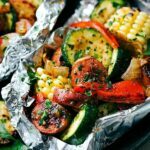 Easy to assemble sausage and veggie foil pack meals. Cut the top off the pepper and remove the seeds. Thinly slice. Remove husk from corn and cut into 1 inch disks. Coarsely chop the onion. Cut the potatoes into small bite-sized pieces -- about 8-10 pieces per potato depending on size. In a small bowl, stir together the olive oil, oregano, parsley, garlic powder, paprika, about 1/2 teaspoon (or to taste) seasoned salt and pepper. Stir. Add seasonings mixture to the veggies + meat and toss well. Place 2 pieces of tin foil on top of each other. Put a generous amount of the mixture in the center and then fold up the first piece of foil and then the next piece of foil to form a secure encasing. Grill covered over medium heat for 16-24 minutes (depending on heat of grill) until veggies are crisp tender. I haven't personally tried these in the oven but I'd recommend 400 degrees for around 30-35 minutes.